The Peoples Vase is a massive piece; statuesque, imposing, and very rare—only ten or so are known for certain. 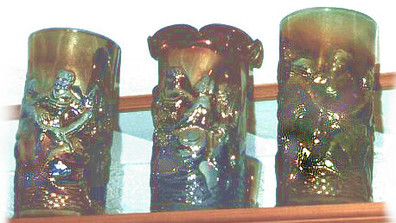 The vase was made in amethyst, green, blue and marigold, and the recent history of their ownership is well known. But ...... what was the inspiration behind the design? Various intriguing ideas have been proposed over the years to understand what the figures on the vase might represent: Amish people dancing, Shakers shaking or perhaps people celebrating Thanksgiving. One fact didn’t quite fit with the old theories, and that was the discovery in the 1990s of the Millersburg glass inventory, and the name “Holland Vase” that appears to have been given to the piece we now know as the People’s Vase. Recently, Vickie Boley (past President of the Holmes County Historical Society) explained a theory she had on this subject. Vickie had spent some time researching the microfilm archives at her local public library, and she came across a newspaper that stopped her in her tracks--an article in the May 13, 1909 Holmes County Farmer that was entitled “HOLLAND’S BIG EVENT”. Vickie further posits “that Mr. Fenton was out to make a name for his new company by creating a special gift for the Dutch Royal family, to mark the birth of the new baby, Princess Juliana. We found Vickie’s theory very persuasive and fascinating. The birth of the Dutch princess was of huge significance not only to Holland but also to the politics of Europe and beyond (without it the sovereignty of Holland would likely have passed to Germany). Vickie’s enthusiasm set us looking deeper into the contemporary background, and we unearthed a few things that we feel strengthen Vickie’s intriguing theory and research. Holland itself went wild when the news of the baby’s birth was announced. The celebrations included dancing in the streets, as shown by the illustration at the top of the page from the Dutch National Archives of May 1909. This is the kind of image that would have been publicised far and wide—another one in the Dutch Archives, also featuring Dutch people dancing in a circle, is an official postcard announcing the birth. The similarity in undeniable between the "dancing in the street" scene in the Dutch National Archives and the figures on the Peoples Vase, who are holding hands and dancing in a circle in a man/woman/man/woman sequence. On the vase itself there is also a male figure, standing alone, with slightly different headgear to the others. Could he represent an official reading the birth declaration? We have seen various formal photos of the event that do indeed include such a figure. The birth was announced and publicised far and wide: added to the fact that a Royal birth often has much public interest, its political significance was enormous. Newspapers all over the world carried details and stories. All the major USA publications had the information, as well as many of the regional and even local newspapers. But the most crucial one, of course, was the report that Vickie Boley found in the Holmes County Farmer. Surely that’s what John Fenton would have read? And it’s not hard to imagine that’s when he decided to produce a spectacular piece of glass as a gift; something that would make people sit up and take notice of the Millersburg Glass Company. We’re grateful to Vickie Boley for letting us share and expand upon her fascinating theory. The history of recent ownership of various Peoples Vases is well known. In 1982 the Millersburg Collection of Jack and Liz Wilson was sold at auction in Ohio, and the attendees received a copy of Wilson's "Millersburg Research Notes" (one of which we own courtesy of Ray Steele) which have a record of the ownership of the Peoples Vases up to that time. Two amethyst Peoples Vases sold at auction in 1996: one was perfect and sold for $43,000, the other was cracked and sold for $13,500. The blue Peoples Vase is very well documented. Jack Wilson states that it was first documented in 1963 when it was sold by Max Penny at an antique show in Wichita, to Emma Schrader for $75. In 1967, Mrs Schrader put it in a John Woody auction when it sold for $1,350 to Charles Thrawley. In 1969 it was sold at Thrawley's auction for $2,700 to a private collector in California. John Woody entered the arena again in 1973 when he bought it from the Californian for $4,500, and doubled his money by selling it in his own auction to Jim Mogg for $8,100. In 1982, it was sold again at another Woody auction to Floyd and Cecil Whitley for $5,000, and it then resided in the same place for around 20 years. In 2006, it was sold at auction for $100,000. Most recently, in June 2018 it has again come up for auction at the annual convention of the American Carnival Glass Association (auctioneer, Jim Wroda). It sold for $155,000.